Congratulations to OCISO mentor Pierre Girard! CFIA employee receives Canada 150th Anniversary Medal! 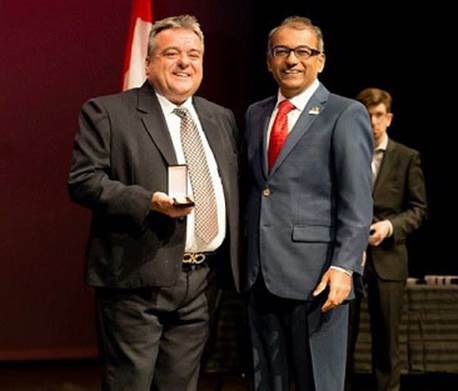 Last December, the Honourable Chandra Arya, Member of Parliament for Nepean (Ontario), presented Pierre Girard, senior human resources advisor at the CFIA, with the Canada 150th Anniversary Medal in recognition of his dedication and professional contribution to the immigrant community. Pierre, what is the significance of this medal for you? 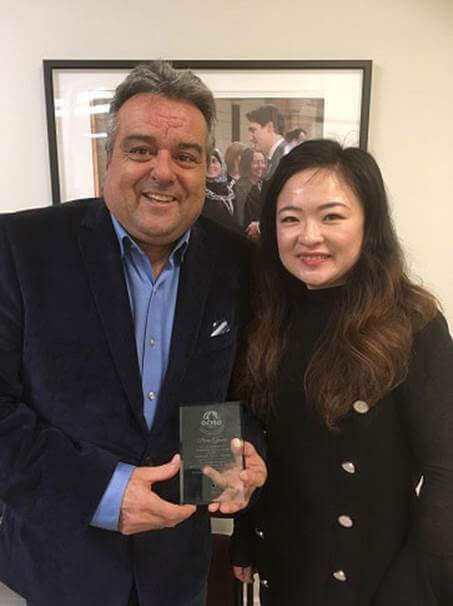 Pierre Girard (PG): This medal is my finest achievement as it recognizes eight years of volunteering – hard work day-after-day, week-after-week – to encourage, guide, and support highly-qualified people who find themselves destitute in a new country. I invested hundreds of hours away from my family to give all of my mentees a chance to find a job and regain their dignity. Tell us about your contribution to the Canadian immigrant population. PG: I joined the Public Service in 1999 after more than 30 years in the private sector as a Director of Human Resources for nationally and internationally renowned companies. I worked in several countries and I wanted to share my experiences. I met people from the Ottawa Community Immigrant Services Organization (OCISO), dedicated to helping immigrants improve their chances of employment. I was given the opportunity to be a mentor and have, since then, never stopped helping these extraordinary people. Volunteer work has given me the chance to provide Canadian companies with people of exceptional talent who have been trained in other countries and who contribute to the growth of Canada. What kind of mentees are you entrusted with? PG: Most of them have recently arrived in Ottawa and have not had the opportunity to build a network of contacts sufficient for finding a job. All are graduates of universities in their country. My current mentee has a master’s degree in Food Science from Aleppo University in Syria and a PhD in Food Science at the University of Berlin in Germany. She speaks very little English and does not speak French. This type of candidate offers an incredible challenge for both the person and the mentor. I also helped a woman who came to Canada with two master’s degrees, including an MBA from Jaipur University in India. She left her country as a researcher for a large Dubai company. She has several important publications and achievements. Thanks to her hard work and support every week, she is now a research assistant at a major Toronto-based pharmaceutical company. How long does it take for them to find a job? PG: The time varies according to the expectations of the candidates and their professional qualifications, but for the years that I coached, it generally took about 9 months to get there. The first thing I would tell them during the interview is that the time we spend together will be the most difficult and frustrating part of their career, but with a positive attitude and hard work, success is guaranteed. What qualities are needed to become a mentor? PG: Each mentor has his way of working and guiding his mentee. I would say that you have to be positive and willing to encourage even in the most difficult moments. You also need to know interview techniques, prepare your questions, follow up and most importantly, learn from each interview. The mentor must specifically know how to write a résumé that is adapted to each job. Some candidates have résumés with too many pages, which greatly reduces their chances of employment. Finally, we must love this work and find a source of personal satisfaction. Volunteer work requires an iron discipline. But when we celebrate success, all the gold in the world cannot buy the joy that the candidates return to us. One becomes their spiritual advisor and even during their new career, they continue to inform us of their progress. How can you become a mentor? PG: You can become a mentor in this program by contacting OCISO at www.ociso.org. I want to thank the CFIA for always supporting and encouraging me throughout these years. Although this work has always been done outside of my working hours, with my superior’s approval, I did happen to meet a candidate in need before his selection interview. Congratulations to Pierre Girard for his hard work and dedication in helping so many newcomers enter the Canadian labour market.